Don’t Copy & Paste Your Way to the Bottom of Search Results: Make Sure Your Website Content Is Always Your Own – and Protect It! 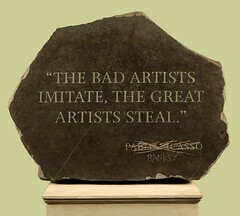 While artists like Picasso and, more recently, Banksy might, with tongue in cheek, condone theft in the name of greatness, doing so online can kill your search engine ranking. The success of your internet marketing depends a great deal on the text that appears on your website pages, blog posts, directory listings, etc. There’s been a great deal of controversy over how damaging it is for a business to have “duplicate content” – that is, text content that is copied from one place to another on the web (even on the same website). While the detrimental effect of duplicating your own content is still hotly debated, there is no controversy about duplicating content that is not your own. In short: Don’t do it. It might seem harmless to copy and paste bits or even sections of text from other sources, such as using Wikipedia to fill in information about your area, but it is illegal…and devastating to your search engine rank when (not if) discovered. “plagiarize.” Merriam-Webster.com. 2012. http://www.merriam-webster.com (20 July 2012). So, if writer “A” uses text previously written by writer “B” without proper credit, writer “A” is plagiarizing the work. Copy and paste are useful functions in electronic media, but should never be used to pass someone else’s work off as your own. 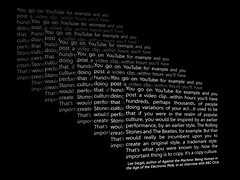 Plagiarism on the internet, generally referred to as “content scraping,” is simply copying and pasting content (text and/or images) from a source without proper citation. Content scraping has been around for a long time on the internet and was used extensively for years, without repercussions, to build search index-able content for websites. Those days are long gone. Plagiarizing content now can have serious consequences from a legal and search rank point of view. What Are the Legal Dangers of Internet Plagiarism? Today, there are a number of tools used to identify content scraping. Businesses and organizations that discover plagiarized and/or improperly cited work can slap the plagiarist with a Digital Millennium Copyright Act (DMCA) Removal Notice. If the scraped content is not removed or cited properly, the business or organization may file a copyright infringement lawsuit. What Are the Search Rank Consequences of Content Scraping? Search engines like Google, Yahoo & Bing view unoriginal content as a hindrance to delivering quality results and will penalize websites using scraped text. When (not if, these days) discovered, search engines penalize plagiarized content by lowering rank or, if the content scraping is severe enough, removing a website from its results. If you re-publish without proper citation, you will likely see a drop in rank and, hence, in visits via the search engines that have made the discovery. Google Panda rolled out in February of 2011 and has received 13 major updates since. Panda’s focus is on both rewarding quality content and slapping sites with little quality content, stolen or duplicate content, and a high ad-to-content ratio. Bing and Yahoo also penalize scraped content they discover. An article from your chamber of commerce might be a good resource for your website visitors, but it won’t help you at all of you drop off Google, Yahoo and/or Bing. Despite the high potential for penalization, there are many websites that plagiarize content and attempt to establish their “version” as genuine, meaning you need to protect your content. How Do I Protect Myself from Internet Plagiarism? There are many tools available to businesses and organizations for fining plagiarized content on the web. If you have a small website or publish new content infrequently, you can generally get by with a free service such as Plagiarism Checker or Article Checker, which allow you to search for duplicate content by (ironically, enough) copying and pasting text or entering individual URLs. If you have a larger site and/or publish frequently, you will want to consider a paid service from providers such as Copyscape or Plagiarisma. If you find a site has plagiarized your content and you want to take action on the copyright infringement, you may use the DMCA Online Service Provider directory to find a designated copyright agent to contact. Subscribe to the Internet Marketing feed from InsideOut Solutions. 1. In my blogs, I will sometimes quote from another site, and credit it. This is still ok, right? 2. Photos. What about photos that I use from sites like Flickr, (after getting permission from the owner). This is still a copy/paste process. Do you see this will be seen as plagiarism? For text quotations, you will need to select an accepted style (APA, Chicago Manual of Style, etc.) and use it properly for all quotes. For photos, proper credit depends on the requirements of the source (i.e. 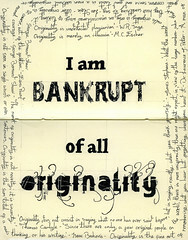 Creative Commons (CC), used with permission credit from photographer for non-CC images, etc.) – check the requirements of the source and follow it. In all cases, link to the source whenever you can; it helps search engines know that you are citing a source, which lends authority to both that source and the trust they can give to your own website. Great article. One thing I believe missing in the piece is more proactive protection against site scraping. You mention several reactive approaches to find duplicate content and get it taken down, but all website and blog owners should have security installed to prevent site scraping in the first place. See distil.it, cloudflare.com, or blockscraping.com.